The Tableau toolbar provides quick access to a number of powerful tools that can make life a lot simpler with a single click. Here are the buttons you’ll find on the toolbar. The toolbar has a bunch of handy tools. Go to Start Page: Returns you to the Tableau Start page, where you can connect to a data source or open a workbook. Undo: Each time you click this button, you move back one step through the history of the actions you’ve performed. Redo: If you go too far with the Undo Button, you can click this button to redo the step. Save: Click this button to save your workbook (make sure to do this often!). Add New Data Source: This button enables you to quickly add an additional data source to your workbook. New Worksheet, New Dashboard, New Story: This button enables you to quickly add a new worksheet, dashboard, or story to the workbook. You’ll need to click the button’s down arrow to add a dashboard or story. Duplicate Sheet: This creates an exact copy of the current worksheet that you can then modify as needed without starting from scratch. Clear: This enables you to quickly clear everything from the current worksheet or to clear things such as formatting, manual sizing, axis ranges, a filter, sorting, or the context. Pause Auto Updates: Use this button to prevent Tableau from updating information automatically as you build the view to improve performance. You can choose Worksheet or Quick Filter updates using the button’s drop-down arrow. Run Update: Click this button to update the data when automatic updates are paused. Swap: This button transposes the fields between the columns and rows and changes the orientation of certain types of charts, such as bar charts. Sort Ascending: Use this button to sort a dimension list by ascending values of the associated measure. Sort Descending: Use this button to sort a dimension list by descending values of the associated measure. Group Members: This button enables you to create a group of selected Dimension members and display their combined results together. For example, if you have almost no sales in certain states, you might group them to show their combined sales as a single bar in a chart. Show Mark Labels: This button toggles the display of labels (typically representing values) associated with the marks on a chart. Show/Hide Cards: This button has a large drop-down list that enables you to display or hide the various elements of the view. Fit: This list box enables you to choose the zoom level for the current view so that you can control whether the entire view is visible in a single screen or whether you need to scroll to see everything. Fix Axes: This button locks the chart axes so that they cannot automatically grow or shrink. Highlight: You can use this button to add or remove highlighting from the chart. 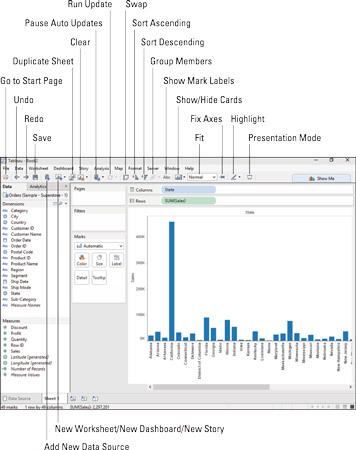 Presentation Mode: This button displays the view in full-screen mode without the Data pane, cards, and other elements of the workspace. It’s very handy for giving live presentations — hence the name.